The deal: On Sundays through March, The Majestic is celebrating St. Patrick’s Day with a multi-course, family-style Irish feast for $22 per person. 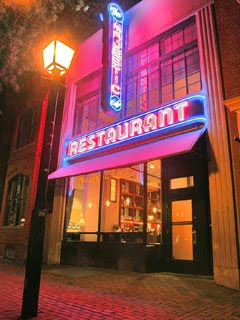 The deets: The family-style Nana's Sunday Dinner at The Majestic is one of my favorite regular deals around town. This month, Dublin-born chef Cathal Armstrong and Majestic chef Shannon Overmiller honor the Irish with a menu of roast leg of spring lamb, garlic scalloped potatoes baked in lamb stock and whisky rice pudding for dessert. Call 703.837.9117 for reservations. Yumm. I cannot wait to try this. What exactly does an "Irish family-style feast" entail? You get all the dishes mentioned, served family style. Typically plenty of food! Are there any other local restaraunts (not counting Maggiano's) that serve family style meals? I think this would be really fun with a group. I did a post on Sunday family style suppers about a year ago. You can find it here. Commonwealth does a nice Sunday roast with big platters of (often local) meats and sides. Westend Bistro was doing a Sunday dinner a year ago - need to check if it's still offered. And of course, Majestic has one every Sunday. Also, 1789 has gotten into some less formal dinners, doing special meals that are served around a big tables with the chef. Stay tuned for a post on their next one.